The remarkable, sophisticated and possibly unique scratch dial on the face of the church porch that I recently featured HERE is not the only dial on this attractive Sussex Church. Almost unremarked are what are passingly mentioned in the only two references I have found online as ‘two further sundials on a north buttress’ (a nod here to the Eastbourne Church Recording Group). These dials do not even appear in the British Sundial Society‘s list of mass / scratch dials (though they do feature the main dial on the porch). Having been told about the three – three! – dials, I was fairly confident when I set out to search for them. The first one – on the porch – was easy, not least because it was on the most obvious, south-facing, location possible. Then the trouble started. Without the Church Warden’s aid, I’d never ever have found the other 2. Who would guess that the dials would be (a) on the north side, (b) a couple of feet off the ground and (c) set at a 90º angle to each other on the same stone block in a buttress. In the absence of any other information, dating these dials is very hard. The church dates from c1150. These dials, almost identical in construction as far as one can tell, are clearly simpler and far cruder than the main dial on the porch that is dated to the c15 and is transitional in scratch dial design between showing canonical hours and the ‘modern’ 24 hour clock. Yet both dials are full circles, and have 24 ‘dots’ surrounding the central hole for the pointer – notwithstanding that only the ‘daytime’ area on each dial is functional in practice. As far as I can make out, this is not an unusual arrangement. It’s hard to find any significant difference between this dial and its adjacent counterpart, other than the direction faced. I didn’t make any measurements, but this 24 dot dial seems smaller, not least because the available space on this face is less. The assumption must be that both dials were made at around the same time, presumably to catch the early morning and late afternoon sun. I’ve no idea why they were located so low on the building, since there are higher cornerstones on this buttress that would have done as well – and perhaps have been more readable at eye-level. Sundials are an interest but very far from a speciality for me. If anyone can shed any light on dials of this sort – date, construction / design, location on the building – please comment on this post, or email me at rollingharbour.delphi [at] gmail.com. And if you know of a similar dial, please get in touch. The majority of churches have no integral sundial. Those that do are usually content with one; some may supplement that with a standing sundial in the churchyard. Very few have three sundials that are integral to the building itself and to its history. The small church of Litlington East Sussex is one such. It also has a large benchmark on the porch, and three superb bells dating from the early c15. 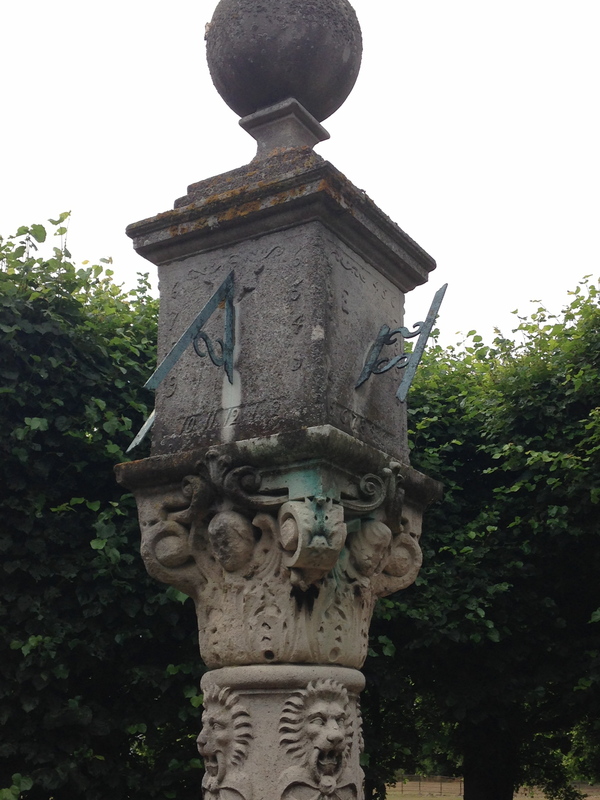 The main sundial is easy to spot; the other two are far less visible. I spent sometime looking for them in vain, until the church warden took pity on me. But (*spoiler alert*) whoever would expect to find sundials low down on a north wall? They deserve a post in their own right, which will form part 2. They are so far undocumented as far as I can see, except locally. The church dates from c1150, and was restored in the mid-c19. The porch is where the quest for the main sundial ends – the benchmark, too. A close inspection shows just how unusual this scratch dial is – quite possibly unique. The only full account of it that I have found appears in an article by W. Oliver published in SCM* Volume 12 1938 Page 529. The link is given below. There are 3 features that immediately stand out: the deep ‘furrow’ at 12 noon; the confusing style / pointer holes; and in particular the carefully graduated hour markings. Do the 3 holes support the theory of an added gnomon fixed below the original style hole? W. Oliver does not give a date for the dial, other than ‘Middle Ages’ (it’s clearly not as old as Saxon). 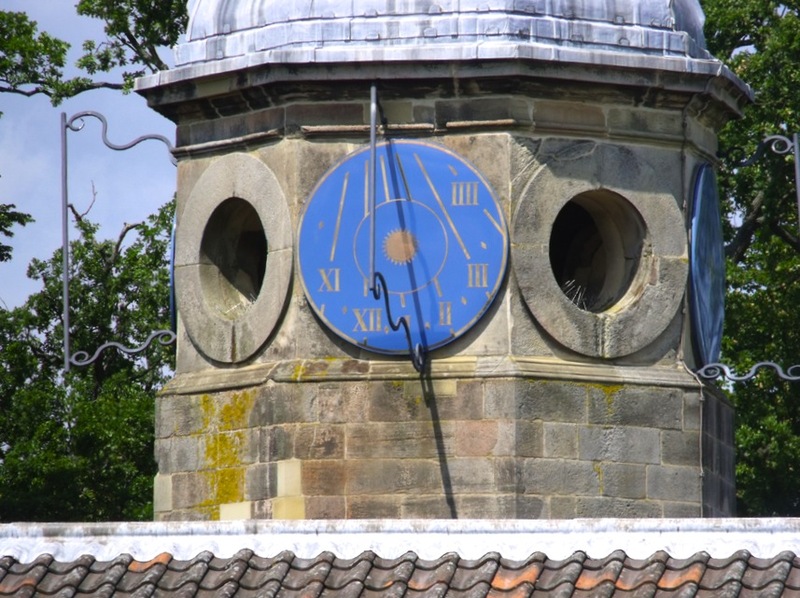 In a website called https://www.bestofengland.com the entry for this church states “Outside there is still a 13th century sundial on the porch”. This dating seems to have caught on and appears in e.g. Tripadvisor descriptions. The local website http://www.litlington.info/st-michael-the-archangel-church-litlington says “Outside, on the porch, is a 15th century scientific sundial…” Given the sophistication of the Litlington dial, the first date seems clearly wrong and the second must be the preferred date. It also fits in with date of the installation of the earliest bell – perhaps a time of general improvements to the church. Even so, in the light of W. Oliver’s analysis, the dial shows an extraordinary understanding of the principles of recording time accurately that is apparently absent in the 1399 other instances of scratch dials in the country. 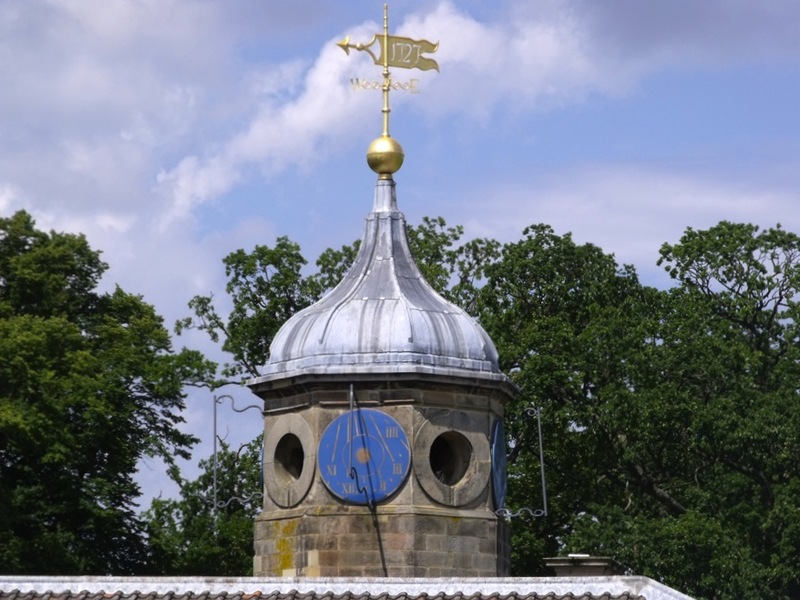 The British Sundial Society has a short entry (see below) for this dial (and none for the other two at the ‘back’ of this church, mentioned earlier), including a reference to a polar gnomon. No mention of a possible date, but I take ‘transitional’ to mean between the era of marking the Canonical Hours and the gradual move to a 12 / 24 hour clock as the standard for time-telling. Any comments about this remarkable dial would be welcome. Florence in January. -8°C at night, zero during the day – but sunny enough in the middle of the day to be able to have coffee or even lunch outside. Apart from the Uffizi, no queues for anywhere. Most significant places on the tourist trail almost to oneself. Despite the cold, there is no frost: the air is so dry that the pavements, piazzas and even the cars are quite clear of frozen white crystals. By the river I caught the electric flash of a male kingfisher flying up from the water to an overhanging bush, his hunting perch. I watched him as he scanned the water below, occasionally diving down and returning to the same branch. 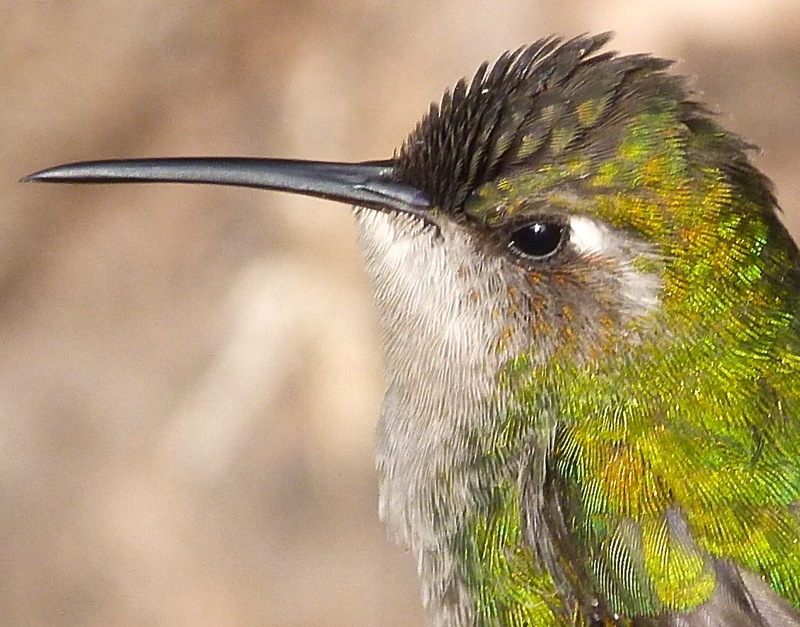 Twice, I could see the glint of a tiny fish in his beak. Since I was 17 I have been lucky enough to visit Florence quite often, not least because Mrs RH regularly goes there on business, and I am a keen ‘trailing spouse’. Over the years I don’t know how often I have crossed the Ponte Vecchio – or even simply walked to the mid-point to admire the views up and down river from the open areas between the pricey shops. This time I was walking the length of the Vasari corridor that connects the Palazzo Vecchio to the Palazzo Pitti on the other side of the Arno. A section runs straight over the bridge and then passes across the facade of Santa Felicita, into which the Medici family could sneak from the corridor to a large private balcony for spiritual refreshment. Passing the middle of the west side of the bridge, in the ‘tourist photo opp’ gap where Cellini’s bust adds to the photogenic view, I have never before looked upwards. 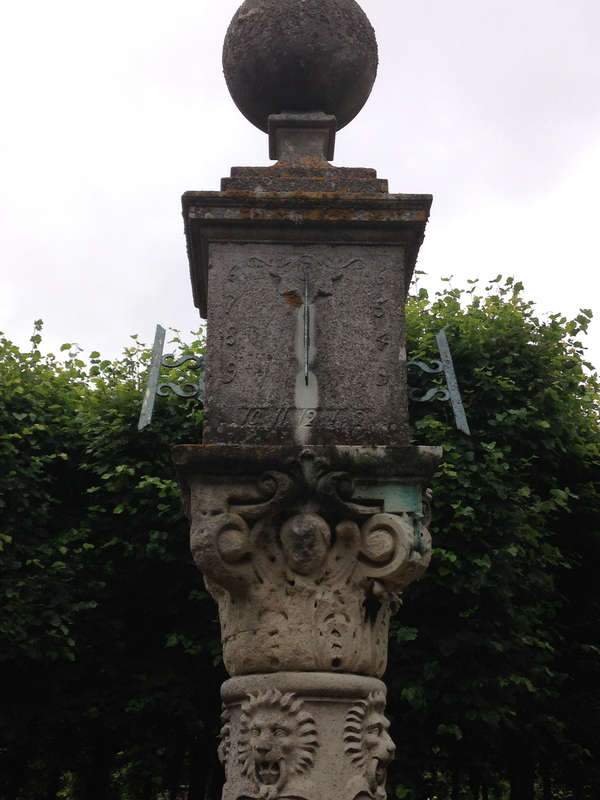 Here, on the roof of a shop, is an ancient sundial, supported by a white marble pillar. An eroded and almost illegible engraving below the pillar records that in 1333, floods caused the bridge to collapse and that “twelve years later, as pleased the Commune, it was rebuilt with this ornamentation”. The sundial itself, with its columnar divisions reminiscent of a rose window, marks the CANONICAL HOURS. The gnomon’s shadow indicates the hour of the day. 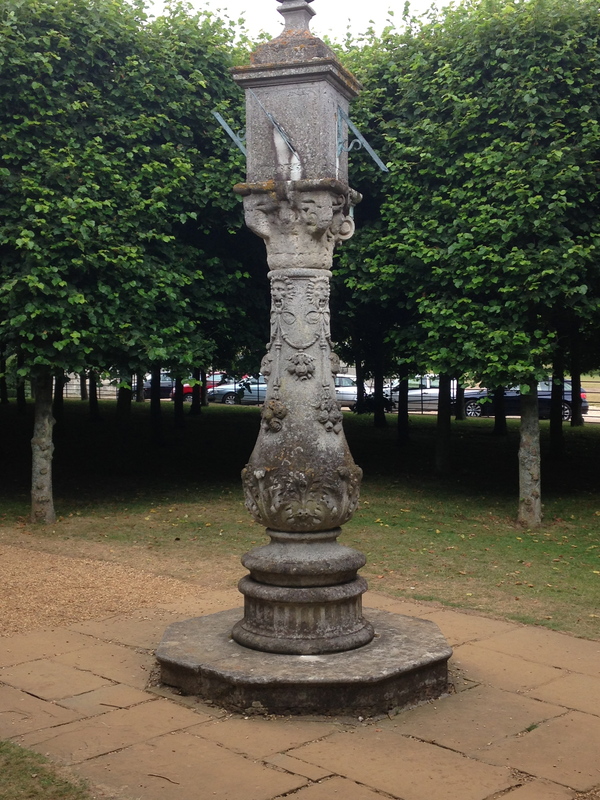 If the sundial is the ‘ornamentation’ to which the inscription refers, then it is around 650 years old. Seeing the sundial for the first time ever, yet in such a familiar place was a reminder that Florence is a city that demands great attention as one walks through the streets. Many buildings, even unassuming ones, have fine adornments high up that will catch the eye… but only if you are looking out for them. 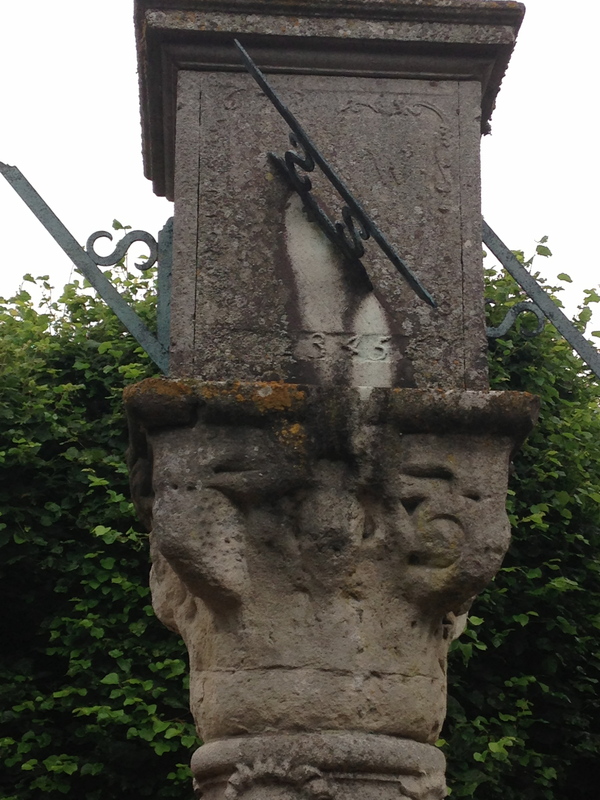 The sundial above is high up on a house in the church square. It doesn’t exactly draw the eye, and would be very easy to miss. It’s on the house next to the Mairie (right, with the Catalan flag), below the small top windows. The main dial is etched and painted on cement, with roman numerals and showing hours, halves and quarters. The long gnomon is attached beneath a small sculpted head from which sun rays radiate – a simple representation of a solar deity. Above the head can be seen numbers, of which only 11 and 8 at the start, and 3 at the end can be made out with any certainty. Possibly, it is a date: the dial (which is not ancient) is otherwise undated and it is very hard to guess its age. I can find no explanation for the initials DS (top left, Gothic font) and ER (top right, normal font). The small dial-within-a-dial shows the hours only, with arabic numerals. The gnomon points straight down. I am unsure of its purpose as a supplementary dial on the same plane, but I hope to find out. The words “COM MES SOL FA MES BE ESCRIC” are Catalan and mean roughly “When it is sunny, I write (show the time) well”. This rather charming inscription was apparently added around 2000 by the village pastor. Credit: for information, Michel Lalos, who has compiled a comprehensive illustrated record of the sundials of the Pyrénées-Orientales. On a recent trip to Houghton for an exhibition, I forgetfully left my camera in the car. 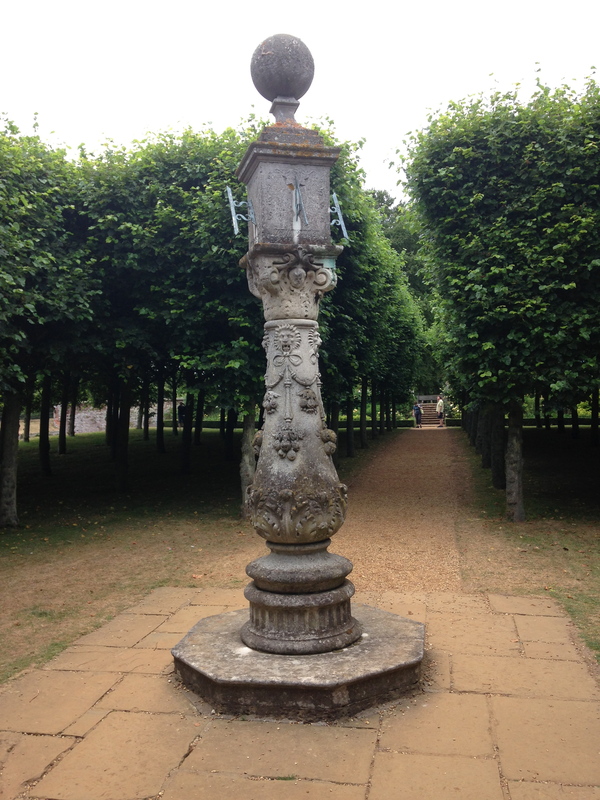 Suddenly we were confronted by a fine ornate C18 pillar or column sundial, fit for one of the marginally better-curated theme pages of this sub-blog, SUNDIALS. Resorting to an iPh*ne in low light was far from ideal, so apologies for the quality of the images. Fortunately you can see the ingenious ways in which the 4 gnomons are attached to achieve the correct shadow angles; and the numbering variations of the faces, depending on their orientation. The result is dawn-to-dusk time-telling. Always provided the sun is shining! By the time we got to the house a light drizzle was falling and there was no hope of a decent photo. I’ve had to borrow, as credited. 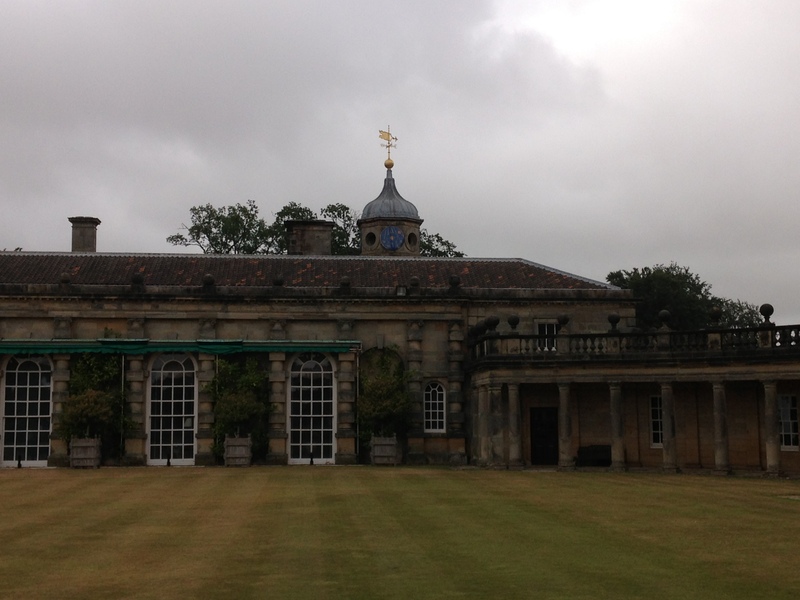 I’ve included 1 poor effort at the end simply to give the sundial’s context in relation to the house. Thanks to Elliott Brown for use permission for the first two. You can see these and his other images HERE. Again, you can clearly see the variations in the gnomon placement; and in the numbering / angling of the faces. And, thankfully, proof that the sun does shine in Norfolk.